A look at the north wall of Gypsum Stack #4, with rainwater running along a canal at the foot of the slope. 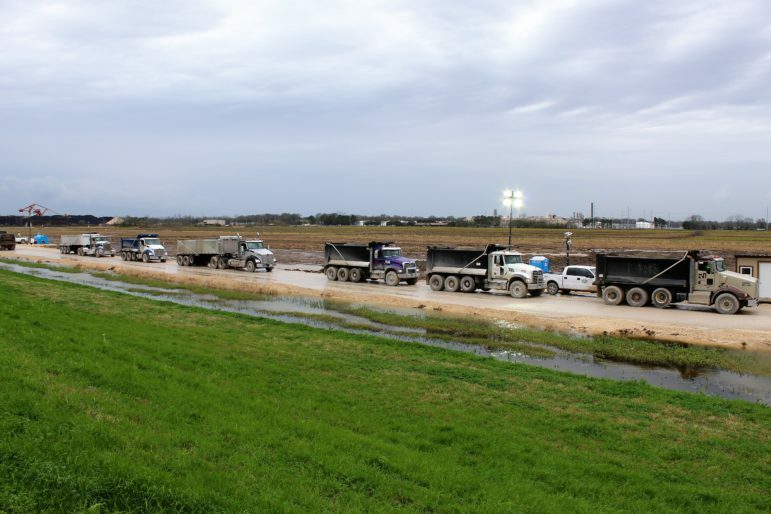 Representatives of Mosaic Fertilizer, LLC say they are confident about their ability to prevent a potential breach of its gypsum-walled reservoir in St. James Parish, near the Mississippi River. The Louisiana Department of Environmental Quality and the EPA have been monitoring the site since last month, when the company first reported that the reservoir may be in danger of a breach. 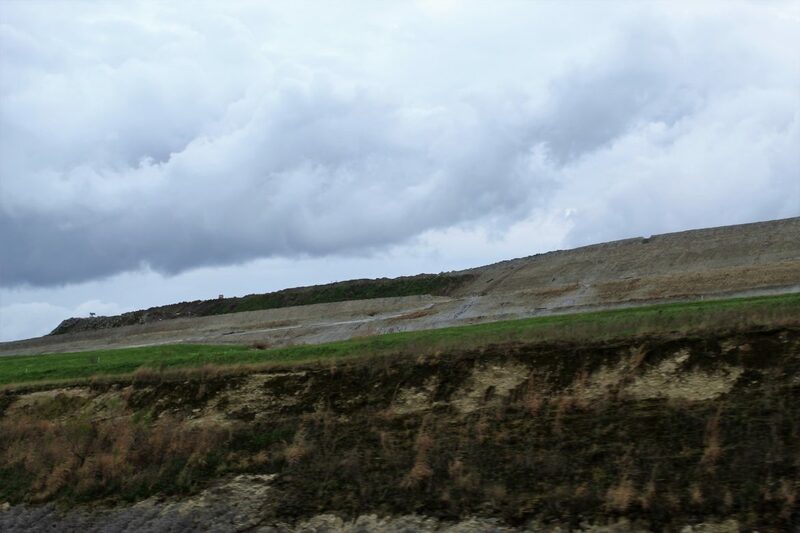 According to the company’s modeling — submitted this week to LDEQ — if a breach were to happen, it would probably be near the top of the north side of the 200-foot-tall gypsum stack. If that were to happen, according to the model, the company would be able to contain the amount of wastewater likely to spill. But LDEQ told The Lens Thursday morning that it wants a “more detailed and complete” breach contingency plan. Meantime, Mosaic is taking steps to secure the reservoir to ensure that any potential leak of acidic wastewater does not escape from their property north of Convent, company representatives told The Lens. 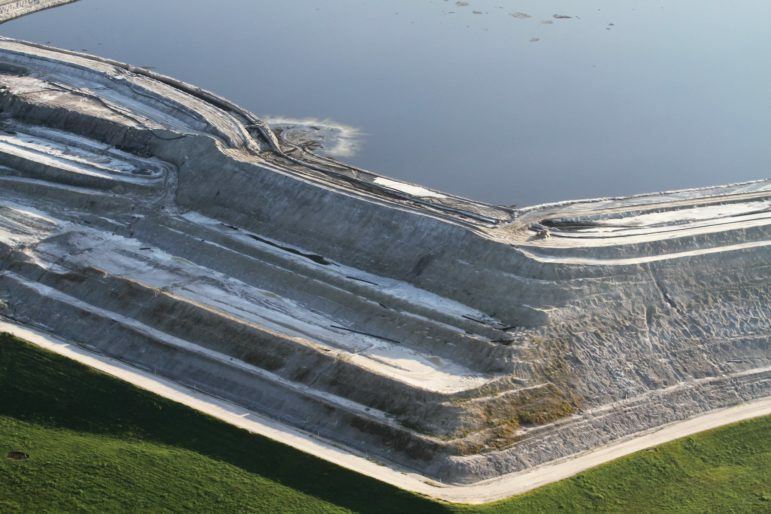 A 2016 aerial photo of the Mosaic reservoir in St. James Parish. As of Wednesday, Mosaic officials reported they had drained the water from its reservoir atop the huge Gypsum Stack No. 4 down to 589 million gallons. That’s down from between 700 and 800 million gallons in the pond on Jan. 10, when movement was first detected in the layers of clay between 85 and 95 feet underground. The company has said removing that water from the reservoir, referred to in technical documentation as Pond 4, takes weight off the stack itself, decreasing the chance that the weight will worsen the “lateral shift” underneath it and potentially cause a reservoir breach. 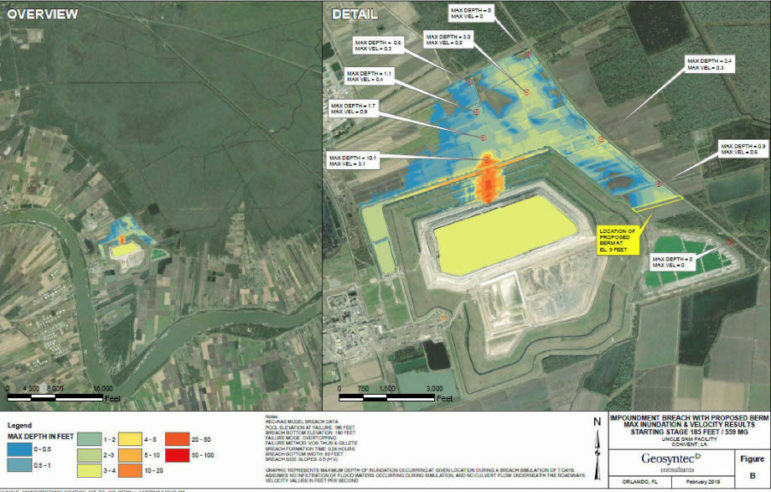 A slideshow presentation the company filed with LDEQ on Monday shows what may happen if a breach does occur. The model assumes a release volume of 159 million gallons of water — a mixture of process wastewater and rainwater — through a potential breach on the northern perimeter dike of the stack, near the point where the underground shift was discovered. Such a release would drain about five feet off the elevation of the top of water pond itself as it poured, albeit slowly, out of such a breach. That projection finds that all the water would be kept on Mosaic’s property, which is bounded at the north and east by two state highways, LA 3214 and LA 3125. If Mosaic’s assumptions are correct, the process water — which is acidic and could pose a deadly threat to animals, vegetation and even people — from a breach would not enter nearby waterways off property, such as the Mississippi and Blind Rivers to the west and east of Pond 4, respectively. Mosaic — which says it is the world’s largest supplier of phosphate and potash fertilizers to the agricultural industry — insists that a breach would not create a fast gusher of process water. 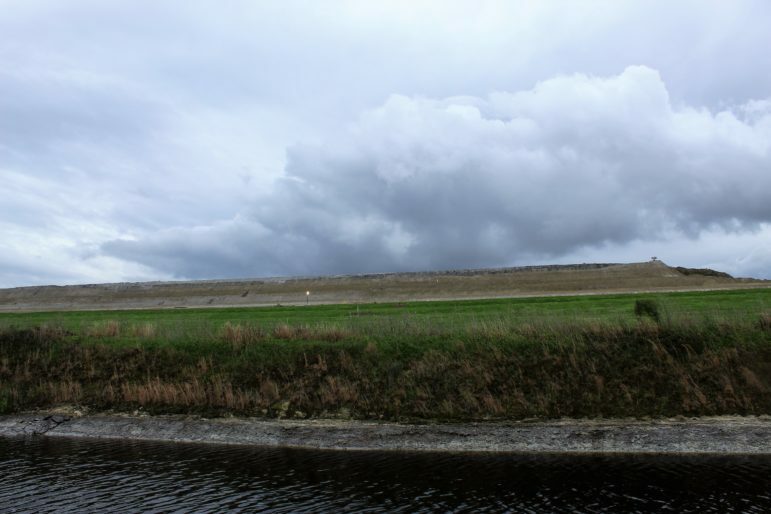 The inundation scenario projects that a 159 million-gallon release would take up to seven days to complete, ending once the water level of Pond 4 dropped to 180 feet. That would put it below the level of the breach modeled in Mosaic’s scenario. A view of Mosaic’s “Uncle Sam” phosphate plant, north of Convent. 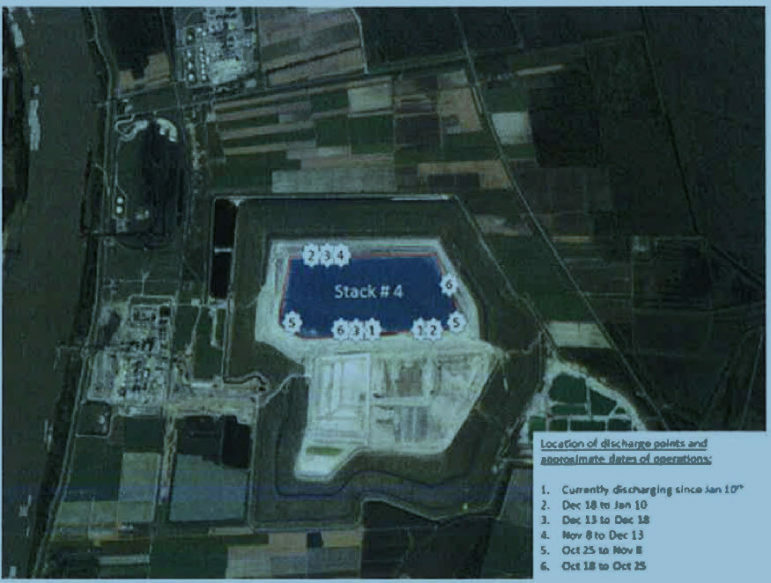 Yasurek said that emptying water into smaller reservoirs on site has brought Pond 4’s level about eight feet closer to what the company believes is a safe level. He said the company anticipates it will take until the end of February to reach the 180-foot level. Company teams have also blocked off 14 storm culverts along LA 3214 and LA 3125 to prevent leaked water from escaping Mosaic’s property line. Four more culverts are left open for now to allow storm runoff, but have been prepared for closure. “Based on our modeling, we believe that we would have about four hours to be able to take any action that we needed” to close the remaining culverts, the general manager said. Mosaic currently is moving the water to at least four other large ponds around the stack, with an approximate total capacity of 588 million gallons. Another half-billion-gallon pond just south of the stack, referred to as the “East Cell,” is being prepared now but won’t be ready until the top of March. Pond 4 itself can hold about 1 billion gallons, company officials told The Lens. Company officials say about 700 million to 750 million gallons of water are generally kept in the reservoir during normal operations at the Uncle Sam plant, which produces phosphoric acid for use in fertilizer manufacturing. And even as the operation continues to prevent a reservoir breach, the plant has continued operations. Mosaic spokeswoman Callie Neslund said Wednesday that about 6 million gallons on average each day are being pumped back into the plant for production operations. And Mosaic’s slideshow states that continued production removes about 2.7 million gallons a day from the overall water inventory, partly through heat from the production process. But as that production produces phosphoric acid, it also produces a slurry of gypsum waste, which is deposited in Stack No. 4 at an average rate of 10,000 gallons a minute. That waste builds the walls of the reservoir. The company deposits the waste at one point in the stack at a time, keeping it at each point and building the wall there for a week to several weeks, before moving on to other points. At the time of the discovery of the lateral shift, gypsum had been deposited on the northern edge of the stack for about two months. He noted that, once the shift was discovered underground, all the discharge points immediately shifted to the south-facing slope of the stack. 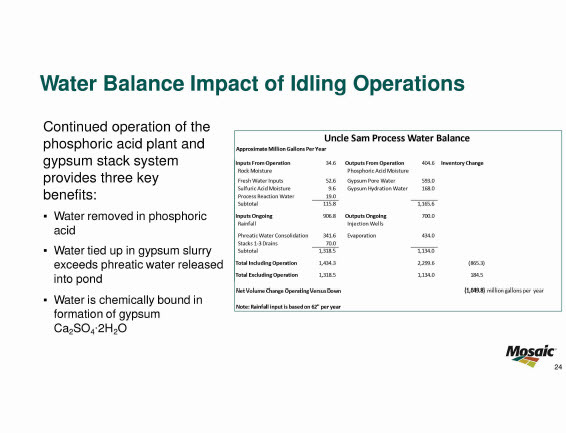 It’s not clear that the extra weight of the gypsum slurry is responsible for the outward bulge. The company has said it would focus on stabilizing the stack slope before determining a root cause. Construction teams working on the stability berm north of the stack. Work continues on a long stability berm in the cane field directly north of Stack No. 4, the land above the shift. The weight of that berm pushes down on the shifting clay, hindering further outward movement of the earth underlying the stack. The company’s slideshow offered a more detailed look at the lateral shift itself, first discovered by a lease farmer on Mosaic’s property as he was clearing cane off the field. 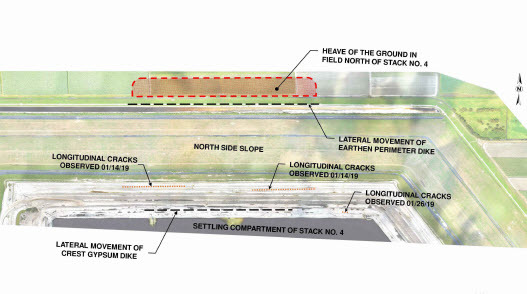 The earth movement in the field roughly corresponds with an outward shift in the northern part of the stack’s perimeter dike, a mound of earth surrounding the wall. The top of the roughly 200-foot-tall gypsum wall has also been displaced but less so. Meantime, Mosaic says it is awaiting the latest test results on water samples taken from the site. The company notes that acidity levels are the main concern with a potential water release beyond the property. Tests are being performed for acidity, along with sodium and sulfate concentrations and radioactive materials such as radium and uranium, which are normally found in the sort of phosphate rock that is used to produce phosphoric acid. An earlier test conducted on samples taken Jan. 25 from the plant’s intake from Pond 4 indicated a radium-226 content of 14.0 picocuries per liter (pCi/L) — a level that’s almost three times higher than the federal drinking water limit of 5 pCi/L. The company was quick to note Tuesday that such levels do not violate federal occupational safety limits. 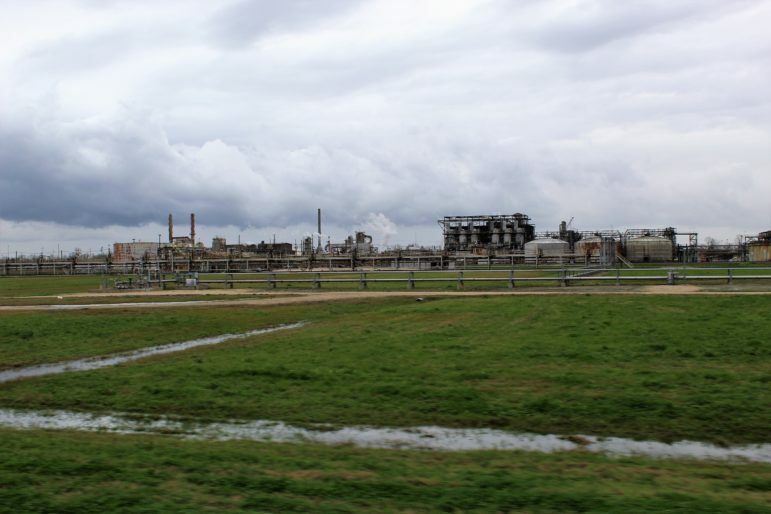 This story was updated after publication with comments from the Louisiana Department of Environmental Quality.